The most famous novel- 'Bhalobasa, Prem Noy' written by the prominent modern poet and novelist Sunil Gangopadhyay. This author wrote many novels with his author life experience, especially in youth age experience. His notable works are- 'Atmaprakash', 'Aranyer Dinratri', 'Saral Satya', 'Kalo Rasta Sada Bari', 'Kabi O Nartaki', 'Eka Ebong Kayekjon', 'Radhakrishna', 'Madhyarater Manush', 'Amriter Putrakanya', 'Buker Madhye Agun', 'Keu Jane Na', 'Agniputra', 'Mahaprithibi', 'Ruptan', 'Sonali Din', 'Bhalobasa Khanda Kabya', 'Sundarer Mon', 'Smritir Sohor', 'Hridoye Probas', 'Kishor O Sanyasini', 'Ami Kibhabe Beche Achhi', 'Itihase Swapnabhanga' etc. 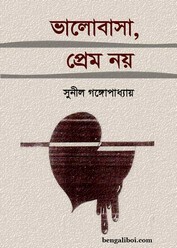 Now I want to share another famous novel of this author- 'Bhalobasa, Prem Noy' in pdf file.